The generic names Hyacinthus, Ornithogalum and Scilla have already been in use since ancient Greek times and represent the core genera of Hyacinthaceae. In his Genera Plantarum (1754) Linné based his circumscription of these three genera mainly on characters of the flowers. As a consequence of this decision, distributing the species that are nowadays believed to belong to the plant family Hyacinthaceae into these three genera would result in a highly unnatural classification. Only the splitting of these old genera into numerous and more homogeneous genera finally resulted in a more appropriate classification with the recognition of mainly monophyletic groups. Today the family Hyacinthaceae consists of approximately 70 genera and 1000 species. The Hyacinthaceae prefer open, sunny habitats with dry and hot vegetation periods. In temperate regions they appear as spring geophytes in deciduous broadleaved forests. A few species like Rhadamanthus urgineoides from Madagascar grow epiphytic on trees in rainforests. The Hyacinthaceae are mostly bulbous plants with subterraneous or epigeal bulbs. The inflorescence is a raceme bearing one to hundreds of flowers. The superior ovary of the flower discriminates Hyacinthaceae from bulbous plants belonging to the family Amaryllidaceae. Only Bowiea with its hemi-inferior ovary is an exception to this rule. The inflorescence of this unusual genus is a strongly branched raceme - a character only shared with one other genus in the family, Schizobasis. The often prominent scape never bears foliage leaves and thus discriminates Hyacinthaceae from Liliaceae sensu stricto. The flowers are mainly visited by insects or in some genera also by birds. 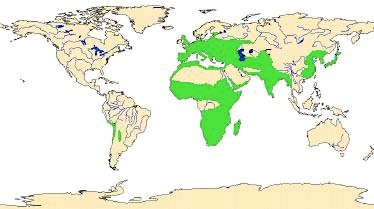 Geographic distribution of Hyacinthaceae (in green). The family has main centers of diversity with large numbers of species in southern Africa and the Mediterranean. The monotypic subfamily Oziroeoideae with the single genus Oziroe is found only in Andine South America. The Urgineoideae are distributed from South Africa to the Mediterranean and further to Arabia, India, and Burma. The Ornithogaloideae extend from South Africa and Southern France to Arabia and India, with Loncomelos ranging from the Mediterranean to the Ural mountains. The subfamily Hyacinthoideae has the widest distribution, extending from South Africa to East Asia (Barnardia), India (Ledebouria), Northwest Europe (Tractema), and Central Asia (Bellevalia, Fessia, Muscari). 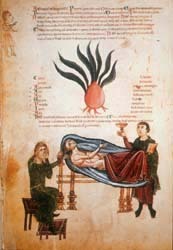 Charybdis maritima, the sea onion, has been in medicinal use since earliest times and was mentioned as early as 1554 B.C. in the Papyrus Ebers of the Middle Empire of Egypt as a cure for dropsy (Figala, 1972). Bufadienolides isolated from C. maritima and Urginea indica aggr. are used for the production of cardiac active substances (Krenn, 1994). Cardenolides from Ornithogalum have apparently not been utilized so far. 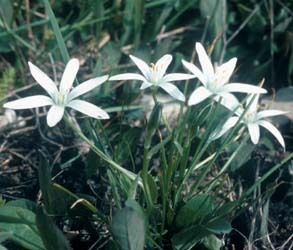 In South Africa, several species such as Eliokarmos thyrsoides, Ledebouria cooperi, L. inguinata, L. ovatifolia, L. revoluta, Zahariadia saundersiae, and several members of subfamily Urgineoideae are poisonous to grazing animals. The toxic compound scilliroside (a bufadienolide) is used for poisoning rats. Hyacinthaceae are only occasionally used for human consumption. 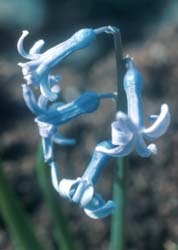 In Greece, the bulbs of Muscari comosum are eaten pickled, and in France, the inflorescences of Loncomelos pyrenaicus are eaten as a vegetable. In Africa, bushmen eat the bulbs of Ledebouria apertiflora and L. revoluta. More important is the use of various species as ornamentals and cut flowers. Species of Chouardia, Hyacinthoides, Hyacinthus, Muscari, Othocallis, Puschkinia, and Scilla, are spring flowers of Northern Hemisphere parks and gardens. In southern Africa, species of Eucomis, Galtonia, Veltheimia, and others are cultivated as ornamentals. Eliokarmos thyrsoides and related species are important as cut flowers. Based on chemotaxonomical, morphological, cytological, and molecular data the members of Hyacinthaceae can be divided into the four subfamilies Oziroeoideae, Urgineoideae, Ornithogaloideae, and Hyacinthoideae (Pfosser and Speta, 1999; Speta, 1998a; Speta, 1998b). Enough evidence has accumulated to demonstrate that the North American genera Camassia and Chlorogalum can no longer be included in Hyacinthaceae (Pfosser and Speta, 1999). Instead, rbcL sequence data (Chase et al., 1995; Fay and Chase, 1996), trnL/F sequence data (Pfosser and Speta, 1999), as well as serological data (Cupov and Kutjavina, 1981) point to a relationship of these genera to Agavaceae, Funkiaceae, and Anthericaceae and not to Hyacinthaceae. Chase, M.W., Duvall, M.R., Hills, H.G., Conran, J.G., Cox, A.V., Eguiarte, L.E., Hartwell, J., Fay, M.F., Caddick, L.R., Cameron, K.M. and Hoot, S. (1995) Molecular Phylogenetics of Lilianae. In Monocotyledons: Systematics and Evolution. (Rudall, P.J., Cribb, P.J., Cutler, D.F. and Humphries, C.J., eds). London: Royal Botanic Gardens, Kew, pp. 109-137. Cupov, V. and Kutjavina, N.G. (1981) Serologiceskie issledovanija v porjadke Liliales II. Bot. Zhurn. (Moscow-Leningrad), 66: 408-416. Dahlgren, R.M.T., Clifford, H.T. and Yeo, P.F. (1985) The Families of the Monocotyledons. Berlin: Springer-Verlag. Fay, M.F. and Chase, M.W. 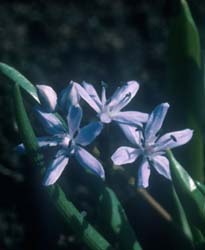 (1996) Resurrection of Themidaceae for the Brodiaea alliance, and recircumscription of Alliaceae, Amaryllidaceae and Agapanthoideae. Taxon, 45: 441-451. Figala, K. (1972) Wandlungen des Arzneibegriffs. Die Meerzwiebel als Heilmittel von der Antike bis heute. Verûff. Forschungsinst. Deutschen Mus. Geschichte Naturwiss. Techn. A, Kleine Mitt, 117: 8 pp. Krenn, L. (1994) Urginea. In Hagers Handbuch der pharmazeutischen Praxis (Bruchhausen, F., ed):, pp. 1030-1050. Linné, C. (1754) Genera plantarum, Holmiae. Pfosser, M. and Speta, F. (1999) Phylogenetics of Hyacinthaceae based on plastid DNA sequences. Annals of the Missouri Botanical Garden, 86: 852-875. Speta, F. (1998a) Hyacinthaceae. In The Families and Genera of Vascular Plants (Kubitzki, K., ed) Berlin, Heidelberg, New York: Springer-Verlag, pp. 261-285. Speta, F. (1998b) Systematische Analyse der Gattung Scilla L. (Hyacinthaceae). Phyton (Horn), 38: 1-141. Ornithogalum umbellatum sensu lato L.
Page: Tree of Life Hyacinthaceae. Hyacinthus, Ornithogalum, Scilla and their relatives. Authored by Martin Pfosser and Franz Speta. The TEXT of this page is licensed under the Creative Commons Attribution License - Version 3.0. Note that images and other media featured on this page are each governed by their own license, and they may or may not be available for reuse. Click on an image or a media link to access the media data window, which provides the relevant licensing information. For the general terms and conditions of ToL material reuse and redistribution, please see the Tree of Life Copyright Policies.